Showing results for tags 'macross zero'. Xigfrid posted a topic in The Workshop! My friend's VF-0S toy has fallen off to the floor and the metal hinge has broken. I was thinking to write to Mr. K about it but I'm from South America and I doubt he or Arcadia can send me any replacement. Any solution? 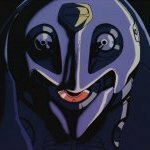 Is it just me or does the Mayan birdman/protoculture genesis theory from Macross Zero sound a lot like the ancient astronaut theory pitched in the history channel's shows Ancient Aliens and In Search of Aliens? Don't get me wrong, I don't subscribe to it. It's just scifi to me at this point. The parallelism is just interesting. Hi guys, I have a question about the VF-0S Model WAVE made a few years back. I was just thinking, Since I have never made a wave kit, Does it have a separate Fighter mode like the VF-1's have? I've seen pictures of the VF-1's having a Fighter mode and they can be combined with the Battroid kit to form Gerwalk mode. Or is the kit just in Battroid? I've had my mind set on getting WAVE's 1/100 Hikaru's VF-1S Strike, but I first want to try their VF-0S. This will be my FIRST WAVE kit and I just wondered if it had a Fighter kit sold separately, And how hard WAVE kits are (I believe they are super hard, in my opinion to see that THEY ARE MOLDED IN MOSTLY WHITE AND GREY!) So if you guys know if there is a Fighter mode of it I would appreciate it. Actually, I finished this last week, but my computer died, and couldn't get around to uploading the pics until now. Heard horror stories about the decals on this one, but I never had any problems. Just kept Mr's Mark Softer and Setter close at hand. I had originally planned on having a standing Nora next to the plane, but unfortunately instead of carefully bending her, I broke her. Guess I should have use actual boiling water, and not just very hot water. As usual, more can be seen here. 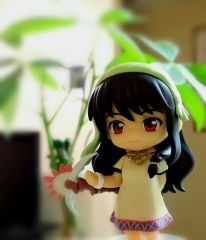 Hi everyone !! Last night, while taking another look at Tenjin Hidetaka's Macross art works, specially to the VMFAT-203 Hawks VF-0C flying over a Daedalus picture, I started to entertain the thoughts of kitbashing a VF-0C and/or VF-0B from the Hasegawa VF-0D and VF-0S kits available. As you may know, VF-0C & VF-0B productions were discontinued long time ago due to being both limited editions, and to find a kit at an affordable price nowadays is nearly impossible. Have anyone of you guys (specially our modelling masters or the ones that have the VF-0S or D under the belt) thought about this idea before ?. How complicated could be ?. Any additional or special work besides frankenstaining two kits ? Any references or previous topics about this subject ?. Any comment will be highly appreciated. Cheers ! 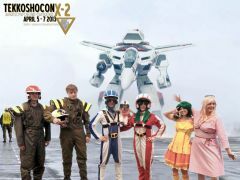 I composited our group picture from Tekkoshocon with a great valkyrie picture that I found with google. I can't take any credit for the background image but my hat's off to whoever created it. 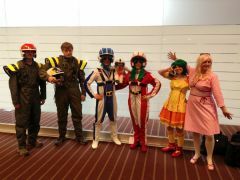 Valkyrie Aces meet singing sensations Ranka & Sheryl at Tekkoshocon X-2. 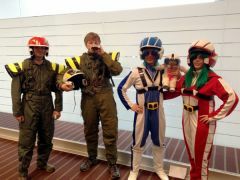 Shin, Roy, Max, Komilia & Milia at Tekkoshocon X-2. 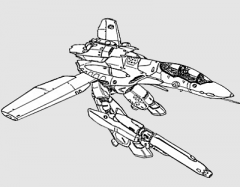 Hey guys, I have been looking at screengrabs from Macross Zero, images of completed Hase F-14's from Macross Zero, and the instructions that came with the Hase Macross Zero Tomcat(scans). Can anyone tell me which paints are needed? Not so much the engine areas but the overall paint scheme. For example the corresponding Model Master, Tamiya paint numbers, et al. Also, sometimes it's hard for me to tell what paint scheme Shin's Tomcat even has. At 1st I thought it was the Tactical Paint Scheme, but in some shots it looks like it is just 2 tones of cool grey, dark for the canopy frame, and a lighter grey for the body(but still a cool grey). In some shots the overall body just looks light grey, especially for the completed kit. However in Hasegawa's shots, the sample looks like it has a cool grey. 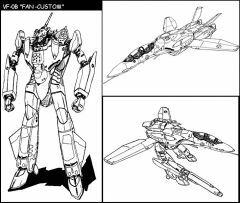 Also from the scans for the Hase kit that I have seen, the paint schemes shown are for VF-74 and VF-84, both of which had different applications compared to Shin's Tomcat. EDIT: Is it supposed to be the "Dark Ghost Scheme" that VF-103 had after being revived as the Jolly Rogers? Hervé posted a topic in The Workshop! Hello, few pics of my present work : the SV-51 from Hasegawa. Very little changes, The main goal is to apply a special paint, inspired by those views (I will keep the anti-UN markings). 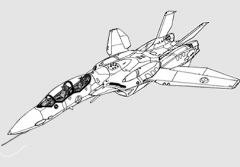 The kit is now ready for the paint : Flanker/Fulcrum family... style_emoticons/#EMO_DIR#/wink.gif Thanks for reading.